Marvel has gone through a number of different Superman-type characters over the years. For many decades, Marvel seemed content to not have a Superman type. Brian Michael Bendis introduced the Sentry in his New Avengers series (complete with an interesting but ridiculous backstory), but he never really took off. The latest attempt has been to convert Hyperion, the Superman analog created in the Squadron Supreme series originally set on another Earth, to be the Avenger’s Superman figure. Jonathan Hickman included Hyperion in his “supersized” Avengers line-up when the latest volume began but has not really made him have a huge role, even though he was one of the small group recently led by Captain America to see a dystopian Avengers future. However, in Avengers #34.1, writer Al Ewing and artist Dale Keown offer a great take on Hyperion, which is essentially the confused outsider angle that has been occasionally tried with Superman (such as the mixed results of Zach Snyder’s Man of Steel). In Avengers #34.1, a story called “The World In His Hands,” there are really two stories: the external story about a boy kidnapped by a minor super-villain and the internal story of Hyperion trying to adjust to a new Earth (he recently came from a dead universe). Ewing does a really strong job of showcasing both Hyperion’s confusion and difference to the people of Earth. He shows up at the home of the parents of the kidnapped boy and police are so freaked out that they draw guns on him. 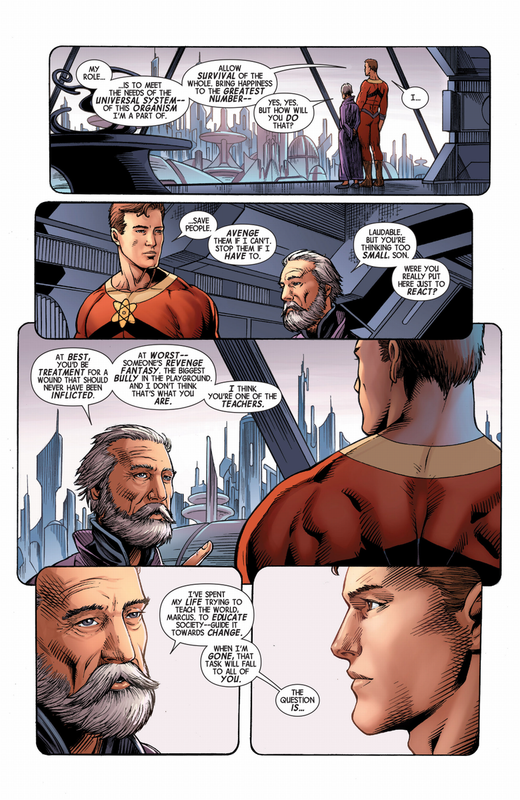 Hyperion also doesn’t know exactly how to talk to people in a way that doesn’t highlight his difference. The loneliness and alien-ness of a super powerful hero from another world are really compelling elements, so it’s strange that Superman stories so often ignore it. Hyperion feels apart, but he is also at his core fundamentally good. He wants to help this Earth’s people. However, his inability to express those feelings makes his goodness interesting rather than painting him as a “boy scout,” as Superman is so frequently called. 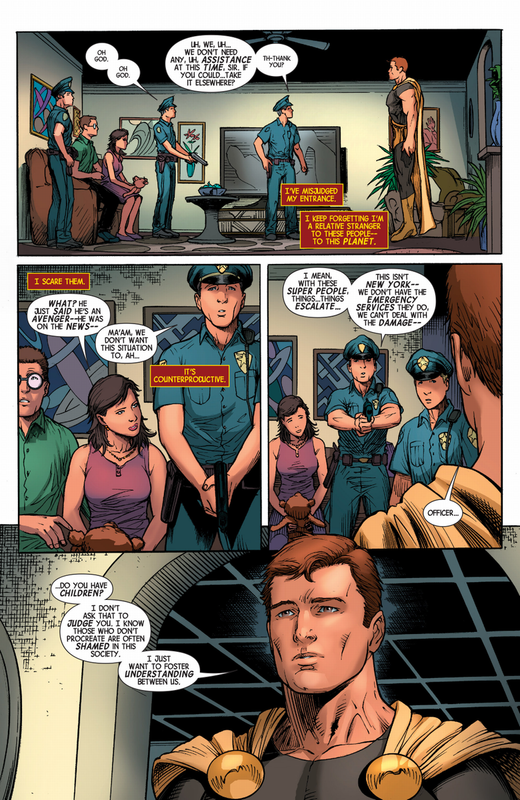 Ewing, through Hyperion’s thoughts, also touches on some philosophical ideas that superhero comics rarely address related to “doing good.” Hyperion is so powerful that he can see that mankind is killing their own world, so he questions the value of helping individual people while the species is slowly bringing about its own doom. He eventually decides that he can both help the individual and try to help the world. I wish more comics were as though-provoking as this one. Just as Ewing is not the regular Avengers writer, Dale Keown is not the regular artist, but he does a fantastic job of making Hyperion look majestic while also keeping the confused humanity on his face. Keown uses a number of splash pages and large panels to tell the story, but it doesn’t come across as gratuitous. Perhaps it’s because the story being told in Avengers #34.1 is interesting and “small,” but Keown also wrings the drama out of the small moments, such as conversations between the kidnapped boy and his abductor, the mentally-unbalanced D-lister called the Mauler. Fill-in issues on long-running superhero series are usually disappointing because the story and/or the art seem unimportant and unengaging. Avengers #34.1 bucks this trend because it is a strong story with strong art. It’s obviously difficult to tell a complete and compelling story in one issue. It would be great if more creators, when given fill-in issues, tried to do what Ewing and Keown do: focus on an interesting element of an underutilized character’s backstory. While Avengers #34.1 has nothing whatsoever to do with Hickman’s current Avengers storyline (which explains the numbering of the issue, I believe), it’s still a very enjoyable issue that’s definitely worth reading.